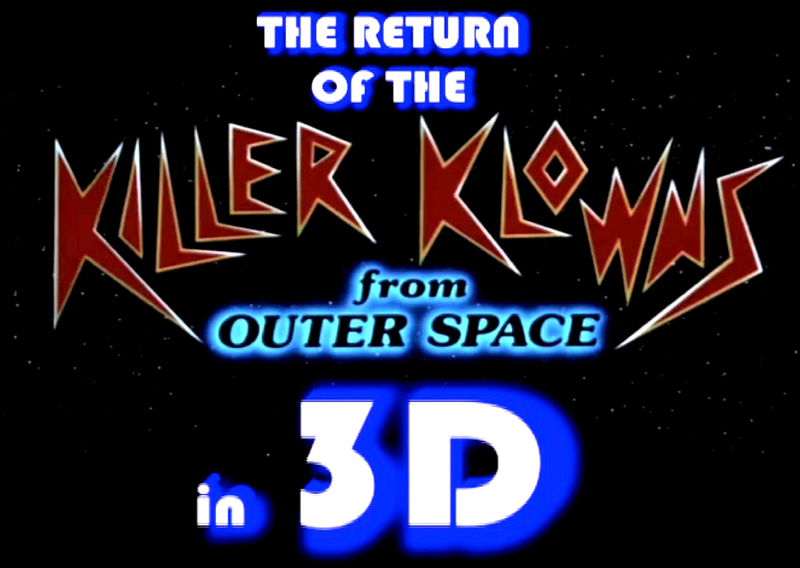 Take My Life, Please: Killer Klowns From Outer Space 2: Best News Ever? Back in the late 90s, I emailed Stephen Chiodo regarding rumors circulating about a sequel to the 1988 cult classic, Killer Klowns From Outer Space, one of my favorite horror films of all time. Stephen told me they were just about to head to a board meeting that day to pitch the idea to the film execs. Unfortunately, I never heard anything back on whether the meeting was a success or not and assumed all was lost. Well, last year, Grant Cramer (who starred as Mike Tobacco in the original film) did an interview with a website where he stated that he and the Chiodo brothers had finished a script to a sequel and were working on getting it made. Cramer said that he was returning to the film's sequel, but would likely be the only original cast member to make a comeback. He also stated that the film wouldn't be a horrid CGI-laden sequel, but would instead rely on the same amazing make-up effects utilized in the original film. Well, I began digging through the internet recently and discovered an official Facebook page for The Return Of The Killer Klows From Outer Space in 3D. While details are still scarce, the facebook page, started in 2010 and is still being continuously updated, informs us that the film is in the late stages of production, which provides fans with more hope than we've had in a long time. So check out the original interview with Cramer here and hit up the official Facebook page here, and stay tuned with Take My Life, Please as I hope to unearth more information soon and perhaps snag an interview with the Chiodo Brothers in the process. Hopefully, the circus will be coming back to town before we know it! One of the best horror/campy/sci-fi movies I've ever seen. I watch it on dvd at least 2 or more times a year. All my kids love it as much as I do.